What sets the Rice Lake RS-130 apart from the other NTEP Approved digital price computing scales on the market? That's an easy question -- First, the RS-130 displays weight in not only pounds, but also kg's and oz's. Second, the scale computes customer change for you! Third, the scale comes with an "in use" cover. Fourth, the scale can operate on standard AC power or the rechargeable battery that's included standard. 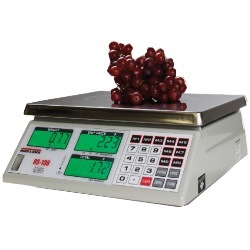 Rice Lake's RS130 retail scale is the ultimate choice for simple price computing applications delivering unmatched convenience and accuracy. For added convenience, the RS-130 can save eight direct price lookups and 89 indirect price lookups. 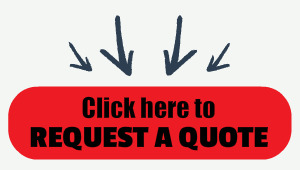 Quickly calculate cash back for applications where a cash register is not present. The large stainless steel platter provides ample room for product and a standard in-use cover assures years of trouble free operation. The RS-130 is NTEP-certified and operates on a rechargeable battery (included). 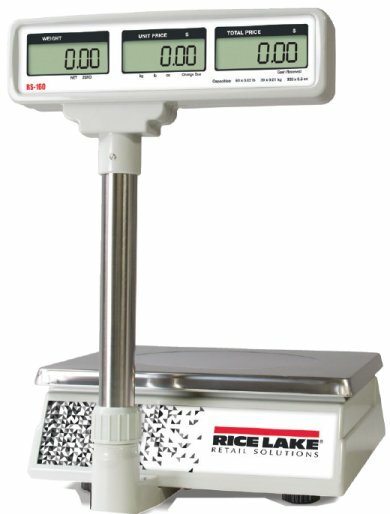 Rice Lake's RS-130 retail scale is the ultimate choice for simple price computing applications delivering unmatched convenience and accuracy. Providing one-button operation, the RS-130 displays weight in either pounds, kilograms or ounces. For added convenience, the RS-130 can save eight direct price lookups and 89 indirect price lookups. Quickly calculate cash back for applications where a cash register is not present. The large stainless steel platter provides ample room for product and a standard in-use cover assures years of trouble free operation. The RS-130 is NTEP-certified and operates on a rechargeable battery (included). A low battery annunciator signals the operator when it's time to recharge. Overall the RS-130 offers the most accurate, portable and affordable solution for simple price computing needs. The system is now available in RS-160 version with 60 lb capacity. You can also purchase either the 30 lb or 60 lb scale with a tower display as well.